Chicago, IL - Renowned Orthodox theologian, professor, and philosopher Dr. Christos Yannaras of Athens, Greece, will speak to parishioners and guests of Holy Resurrection Serbian Orthodox Cathedral in Chicago, Illinois, on Saturday, September 25th, 2010, as part of a week of events celebrating the blessing of the Cathedral frescos. 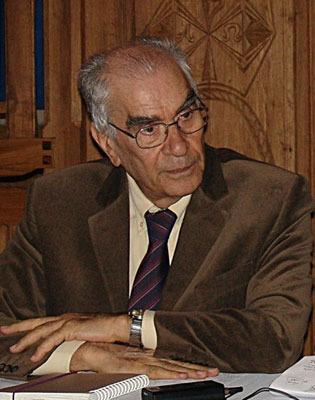 Dr. Yannaras, author of more than 30 books and Professor Emeritus of Philosophy at the Panteion University of Social and Political Sciences in Athens, “has been for several decades one of the most prolific, original, and contemporary Orthodox writers in Greece… [and] perhaps one of the most significant Christian philosophers in Europe,” according to Dr. Rowan Williams, Archbishop of Canterbury. “It is my wish that Orthodoxy participates in the yeasting which is underway in the Americas in order to give impetus to a contemporary and creative Orthodox self-awareness,” Dr. Yannaras said on his upcoming visit. “The central problem of our generation has been to understand and judge the relationship between Orthodoxy and the West. Our current obligation is, I believe, to translate the understanding of these differences into concrete proposals of an Orthodox churched rationale of social relations, which form the reality of our lives,” he continued. Dr. Yannaras’ lecture, “What do we the Orthodox have to offer to the American society today?” ,” will begin at 6:00 P.M. in the Cathedral hall, following Vespers which will be served at 5:00 P.M. The Hierarchical Divine Liturgy and Blessing of the Frescos at the Chicago Cathedral will follow on Sunday, September 26th, 2010, beginning at 10:00 A.M.